Tacrine is a potent inhibitor of cholinesterases (acetylcholinesterase and butyrylcholinesterase) that shows limiting clinical application by liver toxicity. In spite of this, analogues of tacrine are considered as a model inhibitor of cholinesterases in the therapy of Alzheimer’s disease. The interest in these compounds is mainly related to a high variety of their structure and biological properties. 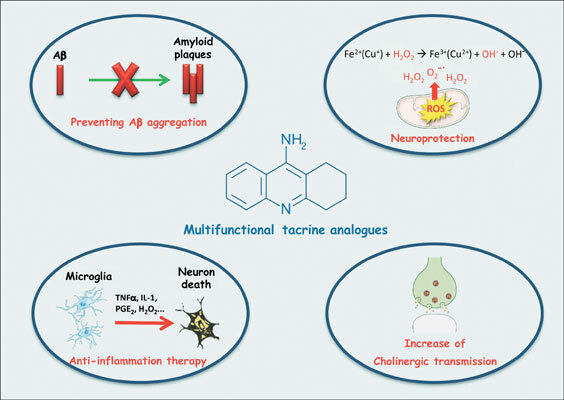 In the present review, we have described the role of cholinergic transmission and treatment strategies in Alzheimer’s disease as well as the synthesis and biological activity of several recently developed classes of multifunctional tacrine analogues and hybrids, which consist of a new paradigm to treat Alzheimer’s disease. We have also reported potential of these analogues in the treatment of Alzheimer’s diseases in various experimental systems. Multifunctional tacrine analogues, tacrine hybrids, Alzheimer’s disease, cholinergic transmission, neuroprotective activity, hepatoprotection.